Ok... so...week one of back to school.... went pretty good... for the kids.. and really good for ME!checked a few things off my "to do" list ... and got two new paintings completed! these two are painted on some vintage sheet music I found at a junk shop. both of these will be matted and framed (20x20), and are works I created for 2 local fundraisers- to be a part of silent auctions. 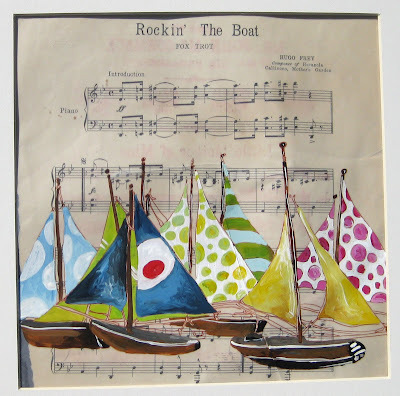 the first piece, "rocking the boat", is a piece I created for our local historical society fundraiser ... "Sailing Through History". Jamie. she always has a great perspective on the issues at hand! I'm reading: working on the "do to" list...Tweet this! I love them, Shelly. I REALLY love them. I really dig the layered thing. 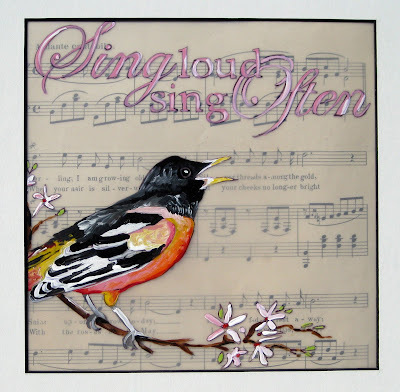 What delightful paintings, so pretty on vintage sheets of music! The little bird singing I can almost her tweet over here. Lovely!!! Oh you amaze me all the time - what beautiful paintings. I tried to paint some art for my house too....then got caught up in shopping and bought something. I wish I could be more like you :). Thanks for the shout out too - I will try and keep my cranky pants off for a time.